This wet dress rehearsal + static fire tests the entire system right up to the point of release, which is locked out. The fixed service structure (FSS) tower is getting upgraded anti-corrosion coatings and metal cladding to minimize maintenance. Stripped out all the old Shuttle equipment, they did. Last edited by Dr Mordrid; 25th January 2019 at 09:22. And if things go wonky with a crew aboard 8 SuperDraco engines, 16,000 lbf/71,200 N each, pull Crew Dragon to safety. Last edited by Dr Mordrid; 25th January 2019 at 09:28. NASA will announce tomorrow @SpaceX Demo-1 is targeting no earlier than March 2 at 02:45 ET (07:45 UTC) for launch, a source familiar tells me. but my time is finally near..."
To placate Russia a US team member will visit SpaceX next week. WASHINGTON NASA managers have given their approval for SpaceX to proceed with an uncrewed test flight of its Crew Dragon spacecraft on March 2. 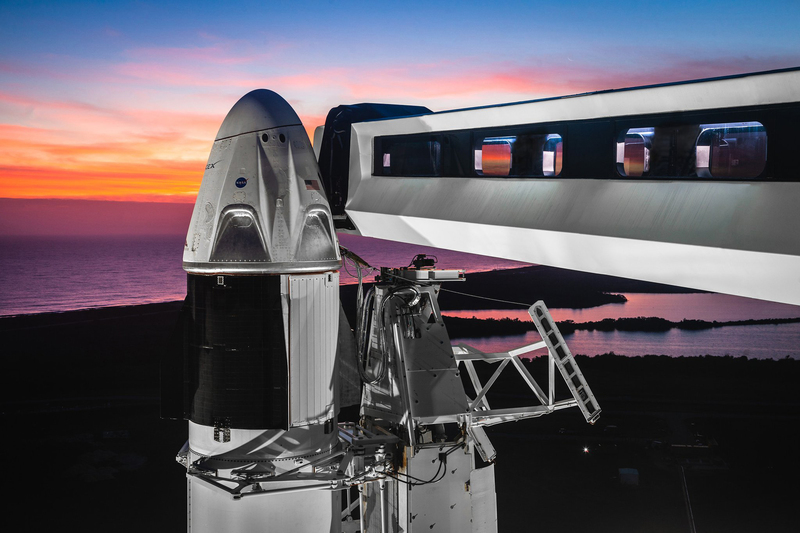 At the conclusion of a day-long flight readiness review at the Kennedy Space Center Feb. 22, NASA announced that it approved plans for SpaceX to fly a mission designated Demo-1, featuring its Crew Dragon spacecraft but without astronauts on board, to the International Space Station. The review featured more than 100 people from NASA and SpaceX, examining the readiness of both the spacecraft and the station to support the mission. The current schedule calls for a launch at 2:48 a.m. Eastern March 2, in an instantaneous launch window. The Falcon 9, lifting off from Launch Complex 39A at the Kennedy Space Center, will put the Crew Dragon into orbit. The spacecraft is scheduled to dock with the ISS one day later and remain there until March 8, when it will undock and splash down several hours later in the Atlantic Ocean. Takeaway from commercial crew news conference this evening: NASA is freaking excited about this test flight. As they should be. As we all are. By the way, I've heard that the webcast for Demo-1 is going to be pretty spectacular. I'm excited to see what @SpaceX has planned to show off their vehicle and its flight. Another "Starman" will be aboard, this one an anthropomorphic test dummy to measure astronaut loads. He will be in a SpaceX spacesuit. Of Course I Still Love You is preparing to leave Port Canaveral this morning ahead of the DM-1 mission on Saturday. Tug Hollywood is towing for this mission! Port Canaveral tugs Florida and Eagle are assisting Hollywood in moving OCISLY away from the dock. Departure! Breaking the turnaround record, OCISLY is outbound for sea just 48 hours after delivering a booster to port! The droneship is heading 492km downrange, north east from the launchpad! Calling all boats: Please stay out of this zone at 2:48am EST Saturday, March 2, as SpaceX attempts to launch Demo-1 from KSC's pad 39A (with booster landing at sea). 2019-02-26: Prelaunch briefing has been scheduled for 21:00 UTC on Thursday. Last edited by Dr Mordrid; 28th February 2019 at 01:09. SpaceX will be using Firing Room 4 at the KSC Launch Control Center. FR4 was used for Apollo and Shuttle. Last edited by Dr Mordrid; 28th February 2019 at 20:09.